Shenzhen, November 26, 2018	(Newswire.com) - The software enterprise WonderShare which is recognized for providing iOS data recovery software and Android data recovery has successfully deployed its Switch app amongst various platforms. Recently, on October 24, 2018, it has launched a new app dr.fone Switch App on Google Play, which is the mobile version of the Switch tool. Anyone who has switched the data from phones manually will know how tedious the process of data transfer can be. The application which helps in the easy transfer data was endowed with the switch tool which was earlier unavailable for the android version. However, with new technology improvements, mobile phones now have the ability to do the majority of the work. The switch app works in real time and directly transfers data between two cross-operating system. It is a must-have application for people who change phone too often. “The times are changing. Today, data is more crucial than ever and safeguarding it was quite tricky up until now. We kept ourselves in the shoes of all the smartphone users and found out that, there was a dire need to safeguard their data by transferring it to other devices. Hence we worked hard on a concept that can help every smartphone user anytime he/she wishes to save their data,” says Tobee Wu, Founder and CEO of Wondershare. Say a new device needs an urgent transfer of data and no laptop is available nearby! This application is a simple gateway for those urgent moment needs. No extra device is needed, data can be transferred from one phone to another easily. “dr.fone has an incredibly simple UI with marvelously explained step-by-step instructions so that nothing can go wrong. This is the best Data Management Software I've come across," says Juan Carlos F., an iOS user who has been exploring the software for a week. 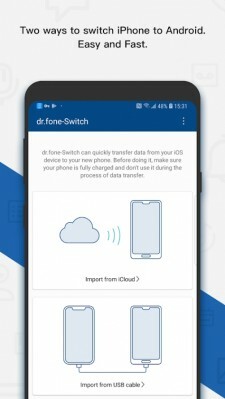 The mobile version of dr.fone - switch app allows one to transfer iPhone messages to Android with an iPhone-to-Android adapter. No separate cable or laptop is required. This app can also be used to get messages from iCloud to Android wirelessly. The switch app is very easy to use as it comes with proper instructions. With dr.fone – switch, one can easily move data between devices with different operating systems and transfer text messages, music, photos, videos, contacts, and many additional file types. All data is transferred easily and securely with just one click without any hack or loss of data. For people, data can mean everything! So, it’s natural for them to become so concerned about it. Moreover, no proper security adds a layer of fear to it. This is the main reason why one needs a secure data transfer application. And, dr.fone switch app is just the right option! The transfer of data can also be done manually. However, it can be a time-consuming process. So, this is when the switch app comes into existence! This data transfer application helps transfer 16 different types of data from iPhone to Android and vice versa. And, with the help of switch tool, you can transfer the data via USB adapter using computer as a medium. Moreover, the different functionality in phone help eliminates the use of a computer system. The software supports iOS version 5.0 and above and Android version 4.1 and above. With all these features, it becomes a must-have application for personal phones/tablets/personal computers. This application makes things easier and is designed to fulfill the needs of a modern user. Wondershare has been honored three consecutive times in Deloitte's "Technology Fast 50 China" list of fastest growing enterprises, and twice by Forbes in their "China Potential Enterprises".